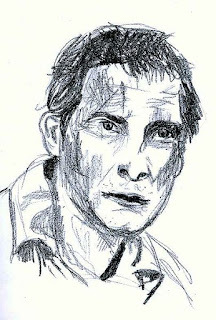 I recently finished reading Hawke's Special Forces Survival Handbook by Mykel Hawke cover to cover, and now I'm reading the SAS Survival Handbook by John "Lofty" Wiseman. Both have a wealth of information, but a few conflicting ideas. At the top of the list is what to do with urine in a survival situation. Yes you can drink urine! The rules for urine drinking are straightforward: Drink it as soon after you urinate as possible; the first time you urinate is usually fine to drink; and you can drink the second pass in dire circumstances. He goes on to say that after the second pass you probably won't be urinating anymore anyway without other fluids going in, but in the off chance that you do you could suffer renal failure if you keep drinking urine because the concentration of waste will build up so much by then that your kidneys can't handle it. Never Drink Either - Never! But both can produce drinking water if distilled - and sea water will provide you with a residue of salt. Besides those two books, who doesn't remember this scene from season three of Dual Survival where Cody Lundin calls out Joe Teti for drinking his own urine? In the exchange above Cody said that people who drink their own urine in a survival situation "don't know what they are doing". Cody's reasoning is sound, and basically follows the idea that urine has salt in it which dehydrates you more. Teti argues that drinking it gives him a psychological edge. 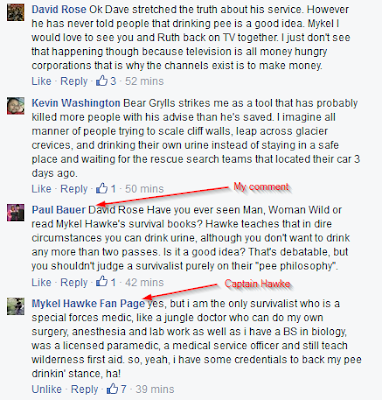 So as you can see and as I mentioned above, Mykel Hawke and Bear Grylls share the same philosophy on drinking urine. As you can see, it appears that Les Stroud shares the same philosophy as Lofty Wiseman in the SAS Survival Manual. So can you drink your own urine? Yes, you can at least once and possibly twice and you will live. Should you drink it? I'm no expert, but I think Wiseman's, Lundin's and Stroud's reasoning on not doing it is more sound than Hawke's or Grylls's for doing it. I think after looking at all of the information, the smart idea is probably to distill it over drinking it straight.